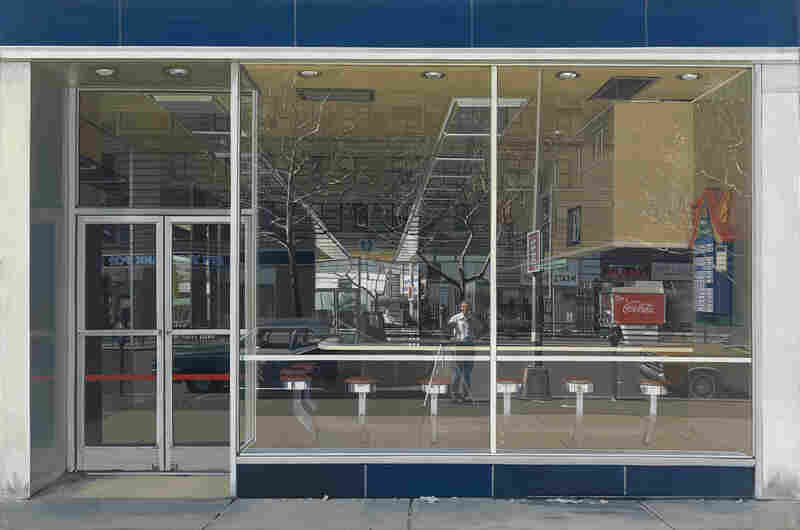 "His window is a photograph," says Jessica May, co-curator of Estes' current show at the Smithsonian American Art Museum in Washington, D.C.
Estes uses photography as a starting point for painting. He goes out and takes dozens of photographs of the same thing from different angles — street corners, diners, reflections on plate glass windows — then he cuts, pastes and manipulates the pictures. Finally, at his easel, he tries to make his painting as faithful to the photos as he can. "Often he's putting two and three photographs together in order to create a complete image, and then basically compressing them into the compositional size and shape that he's looking for in a finished painting," May says. The result is a city street you know you've walked on but that doesn't really exist. "He'll raise the height of a building," May says. "He'll move a car a little bit. He'll transpose the location of a street lamp or light post. ... He composes it." Is That Nat Geo Photo ... A Painting? But why doesn't Estes just stop with the photograph? "I don't know," he says. "I get more money for the painting, I guess." He laughs when he says that, but his paintings are part of some major museum collections. Estes studied art in Chicago in the '50s, then moved to New York where he got a job as a graphic artist. "I worked in advertising," he says. "That's where I started using photographs to make illustrations. I saw all the other people were doing it, all the other illustrators. They didn't put a model in front of them and make a careful drawing." Estes applied those ad lessons to large canvases, producing meticulously painted buildings, windows and sidewalks, and almost no people, except for those reflected in his windows. Also: no traffic jams, dirt or menace, unless you're chilled by the unreal purity and perfection of the streets. Jessica May points out that he does show graffiti and uneven pavements on occasion. 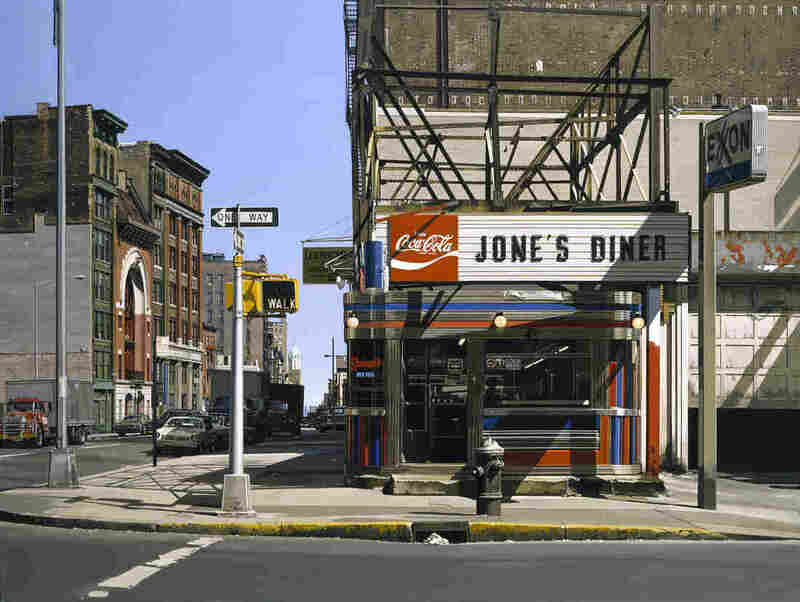 In his 1979 canvas Jone's Diner, Estes reveals a yellow curb that has been scuffed by too many passing cars. "Richard has told me that it takes a long time to paint peeling paint," May says. "It's the hardest thing to paint." Richard Estes, Jone's Diner, 1979, oil on canvas. (Private collection.) Click here for a closer look. 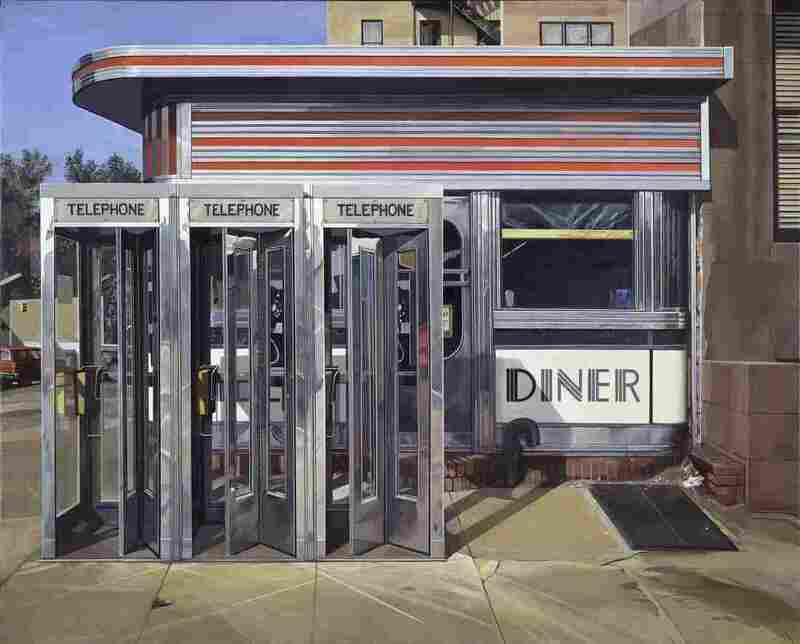 Estes takes chunks of reality — a hyper-realistic reality that's clean and pure — and combines the chunks into something that doesn't really exist except on his canvases. And here's the thing about those canvases, and why Estes says you can't see them in reproduction: They are canvases. "You get up close and they're really paintings," May says. "In photographs, when they're reproduced in books, they often look like photographs. But when you get into this exhibition and you see them as paintings, you see how very present the paint is on the surface." The brushwork, the gesture of paint applied to cloth, the human touch — it's all there. In person (the Smithsonian show runs through Feb. 8), the clarity, precision and sheer meticulous labor of the work becomes mesmerizing.